India's Brahmaputra River is the 29th longest river in the world at 2,948 km long, and has a discharge of 19,200 cubic litres per second which puts northern India's great waterway in the top 10 when it comes to volume. This is a massive waterway, being the only river on Earth clearly visible from the moon during the Apollo missions. Flowing down from central Tibet through the legendary Tsangpo gorges, the Brahmaputra river opens out as it enters Assam to flow across that state and then through Bangladesh to flow out through the vast Sundarbans Delta, merging with the Ganges River, as they discharge into the Bay of Bengal. The Brahmaputra river may be little-navigated today, but in colonial times steamer services operated as far as Dibrugarh. The river in places can be up to 20 miles wide and in the monsoon it floods the entire Assam plain. Indeed, East Bengal is not called “the wettest place on the planet" for nothing – it literally does have the world’s highest rainfall. The river is so vast that any river cruise expedition undertaken here can be movingly wondrous, as you pass through this great emptiness of water, sand and shoal. 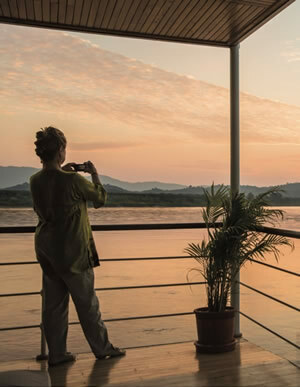 Passengers of our Brahmaputra river cruises enjoy their trips in peace and tranquility with very little human activity on the riverbank. That means the wild life and bird life are profuse.